PVC Roofing Systems were originally produced in Germany over 30 years ago. PVC Roofing Systems are among the most versatile thermoplastics for commercial, industrial, and residential applications. 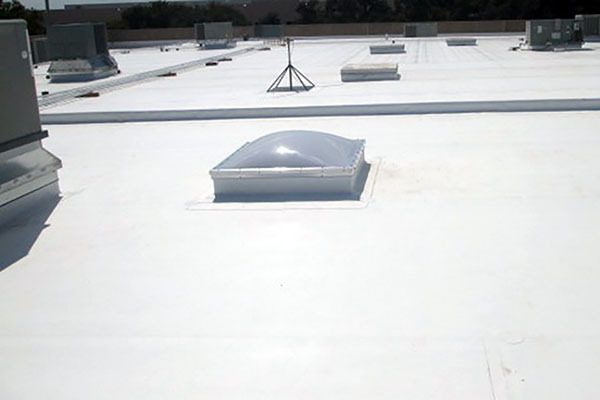 The PVC product is a reinforced membrane with tough solvent or hot-air welded seams. This material has excellent durability and dimensional stability. PVC Roofing sheets are blended with plasticizers, which account for its flexibility. The plasticizers allow the membrane to be used over a wide range of temperatures and is unaffected by ozone. PVC membranes are manufactured to many specifications to achieve flame retarding, algae growth, and resistance to Ultra-Violet light. PVC is an excellent Chicagoland restaurant and food industry roof. PVCs are aesthetically pleasing, lightweight, highly reflective, and are tear resistant. PVC Roofing Systems can be applied by three different ways: fully adhered, loose laid/ballasted, or mechanically attached. Each application has a design engineered to match the building structure or the economy of installation. The seams are then heat welded together to form a high-performance waterproof Chicagoland roofing system. The seams are equal or stronger than that of the membrane itself. Matthews Roofing is proud to include all of these new and technically advanced PVC roofing systems. We are here for the long-term commitment to all of your Chicagoland roofing needs, from now and in the years to come!